If you are new to greenhouse gardening and want to test the waters without spending too much, then the HobbyGrower Enthusiast would be a good way to go. It fills the starter greenhouse niche nicely and can be a great little greenhouse for lengthening the growing season. While there is only one size option (6' x 8'), we think this is fine because if you need more space then we would definitely recommend the Rion Hobby Gardener as a better choice for anything larger. The height of the Enthusiast is the same as the Rion Hobby Gardener at 6' 10", which is plenty tall for all but the tallest gardeners. It comes in the barn-style roof which also helps with more interior head-room than the Juliana Premium or Riga Onion. Installation was probably the easiest of any of the greenhouses and took us only about 4 or so hours to construct. This is far better than the Juliana Premium and slightly better than the Rions. We liked the SnapGlass panels that come with the Enthusiast. They are nearly as clear as glass panels, but infinitely more safe and durable. We tried throwing a few rocks at the panels and they do not shatter or scratch easily, which is a drawback to using actual glass panels. The downside of the SnapGlass panels is that they are much poorer at insulating than the double-wall polycarbonate panels on the other greenhouses tested. This is definitely not the greenhouse to purchase if you want to try to winter over some plants or live in areas that commonly get snow in spring or fall. The overall quality of the Enthusiast was not up to the level of the Rions, Juliana, or Riga greenhouses. The frame was decent but not as rigid or sturdy as the others. But then you are saving hundreds to thousands of dollars, so you need to evaluate just how serious you take greenhouse gardening before making a purchase. You do get a base kit included, as well as 2 roof vents and 1 rear vent. Conclusion: The Hobby Grower Enthusiast is a nice little starter greenhouse that for the money (around $899) is a pretty good value. It takes up only a little room and with it's clear panels is attractive and shows off plants nicely. If you take your gardening serious or live in areas that get snow or winds very often, then you would probably be much better off stepping up to one of the Rions for about $400 more. 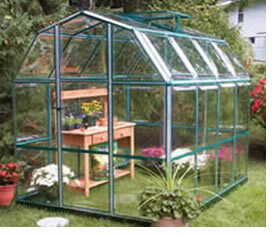 You'll get a much sturdier and longer-lasting greenhouse. The Hobby Grower Enthusiast™ Special Edition is the perfect size for a home gardener who wants to get an early start on seedlings, a chef who needs a bounty of fresh herbs and vegetables, or a plant collector seeking additional protection against winter frost. New patent-pending plastic manufacturing technologies and state of the art design have been combined to create a value-priced, high-quality, easy-to-assemble greenhouse for horticultural enthusiasts.